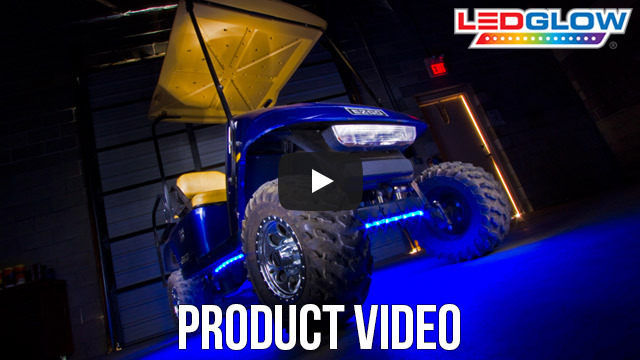 LEDGlow’s Blue LED Golf Cart Underbody Light Kit creates a unique blue underglow to any golf cart using (4) 24” flexible tubes, a control box and wireless remote! LEDGlow's Blue Golf Cart Underglow Kit features 84 SMD LEDs housed in (4) 24” tubes that are installed to the undercarriage of any golf cart. The all new wireless remote allows you to select from a collection of modes that include solid color illumination, 3 fade modes, 3 strobe modes and a sound activated mode that reacts to the music playing from your golf cart using the built-in microphone. The wireless remote features an operating range of 50’ giving you more than enough area to control your kit while on the green or campground. I have used your multi color kit in the past on a different cart I owned and came back when we updated our cart to a newer model, great product, good underbody light effect. I went with the single color blue this time. Never had a problem in the past with these. I do wish it came with a mountable control box in place or with the remote. Easy to install and makes the cart glow at night. Works as stated, great product and very pleased works awesome. Order was shipped immediately . Installed on Club Car golf cart. Instillation was straight forward and easily done. Everything works great. Much better than other lighting that I have seen on golf carts. Very bright and fun as well as very well priced. My golf cart is 31 years old and I have restored it to better than new and the lighting was a great addition and fun to use. I put these under a lifted ez-go and they look awesome! !